2. Add asafoetida and cumin seeds, saute for a few seconds. 3. Add the green gram paste, and the remaining ingredients. 4. Saute till the mixture leaves the sides of the pan and is soft. 5. Rub 1 tbsp oil into the refined flour and knead with enough water into soft dough. 6. Divide the dough equally into 12-13 portions. 7. Take a portion, make a hollow in the centre and fill with the green gram mixture. 8. Seal the filling inside. 9. Repeat with the other portions. 10. Cover the stuffed balls with a moist cloth and keep aside for 10-15 minutes. 11. Roll our each portion into a thin disc of 10” diameter with some dry flour. 12. Roast the disc on a griddle (tawa) on both sides with 1 1/2 tsp oil. 13. Remove and repeat with the other discs. 14. Cover with aluminum foil. 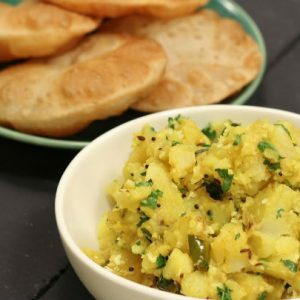 Feel free to comment or share your thoughts on this Moong Dal Puri Recipe from Awesome Cuisine.